"This is a very easy but good recipe. 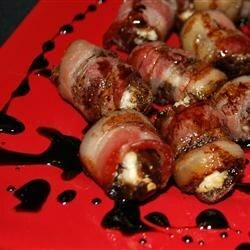 People will think you are a gourmet chef with these dates filled with chevre cheese and pecans!" Slice open the dates, and stuff each with about 1/2 teaspoon goat cheese. Top each date with a pecan, using the goat cheese to hold the pecans in place. Wrap each date with 1/2 slice bacon. Arrange the wrapped dates on a baking sheet. Bake 15 to 20 minutes in the preheated oven, until the bacon is crisp and evenly brown. In a saucepan over medium heat, mix the balsamic vinegar and sugar until thickened. Pour over the dates to serve. Ham and melted Swiss combine with a tangy spread on soft party rolls. Goat Cheese just doesn't create a pleasant taste in my mouth. These were wonderful! I used cream cheese instead of goat cheese though and skipped the pecans. Blue cheese would be a great mix as well. Enjoy!